I was at my friendly neighbourhood watch guy (to check up on a watch I have on order) and he showed me this watch. 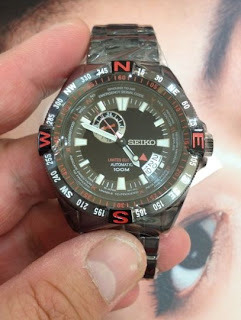 The Seiko reference SSA113J1. It is part of the Seiko 5 50th Anniversary collection. I have to say it is a nice watch. 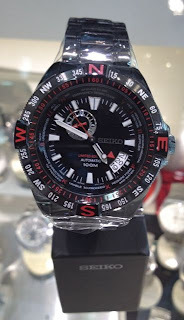 The watch comes in at 42mm and is water resistant to 10 ATM. It has the following functions: hours, minutes, seconds, date and 24 hours display. I don't think the sub dial is a second time zone indicator. The design of the date display seems to be popular at the moment. The watch is powered by the Seiko 4R37 automatic movement. It is a limited edition of only 500 pieces. I am not to sure of the retail price. I understand there is a blue version as well (reference SSA115).